Celebrate two years with WontonInAMillion! This whimsical Etsy shop designs planner goodies, notecards and other gifts, all inspired by delicious dim sum staples. My favorite foods are represented: shumai, bao's, egg rolls, pineapple bao's (my favorite thing ever growing up) and wontons! I was so happy to celebrate their second birthday recently, and you can read a bit about there here. 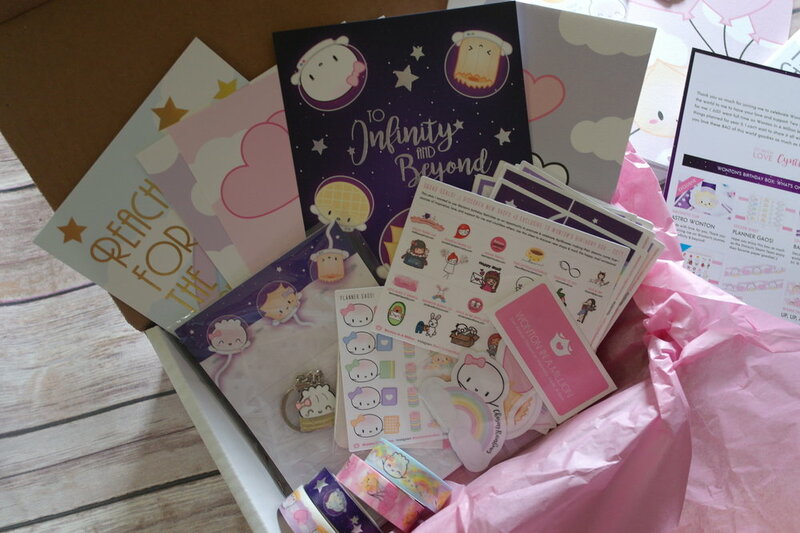 Plus, I snagged a birthday box full of gorgeous planner goodies! Each box came with a list of included goodies. There was so much included, that the notecard was covered front and back. These gorgeous prints are among my favorite items included! Each one is foiled and measures 5x7, so they'd be great to use as notecards or postcards. But being the hoarder that I am, I'm probably going to keep all four for myself and hang them up on my wall, or use them as dashboards for my traveler's notebook! The four notecards included are: Dream On, Dreamer, To Infinity, Reach for the Stars, and Dream Up. Okay, so only one of these notebooks was actually included in my box, but I had to pick up three more for my next set planner setup in the summer. But anyway, each of these dim sum notebooks are standard Midori-sized, so they'll fit neatly into my planner setup! The one I received (and the ones I purchased) have dotted and really smooth pages. This is a 4x6 pad of sticky notes, consisting of 25 lined sheets. I love that this writing pad is huge, a huge memo pad that I can stick at my desk at work, or on the fridge, or just tuck into my traveler's notebook. STICKERS! Cynthia from WontonInAMillion included her "Bao of this World!" sticker kit, which consists of ten sticker sheets in total. They're super fun and cute! I haven't decorated boxes in ages though, so we'll see if I can incorporate these uber cute space wontons in my planner layouts in the future. There are also three laptop stickers pictured that were included in the box, and you already know that I'm going to stick them on all the things. This exclusive sticker sheet was one of my favorite things in the birthday box! It's filled with other Etsy business owners, some of which I've never heard of before. If you read my other blog post about the WontonInAMillion celebration, you know that I love supporting small businesses, so I'm looking forward to giving these #girlbosses some love! Next up are these fun and versatile little accessories! The Astro Wonton magnetic clip is jumbo sized. I can use it in my planner to mark my pages, or in my next read. The other thing in this picture is the Blushy keychain charm, which was a limited edition item just for this birthday celebration! It's so cute! It's not chunky, and slim enough to slip onto my keyring or anything else, without adding any significant weight. Last but not least, the birthday box included four (that's right, FOUR) rolls of washi tape! The designs are Steamie, Up Up and Away, Rainbaos, and Silver Galaxy. The purple galaxy one has silver foiling and it's absolutely gorgeous. And that's a wrap! I'm looking forward to incorporating some of these items into my planning style. Congrats again to Cynthia and WontonInAMillion!